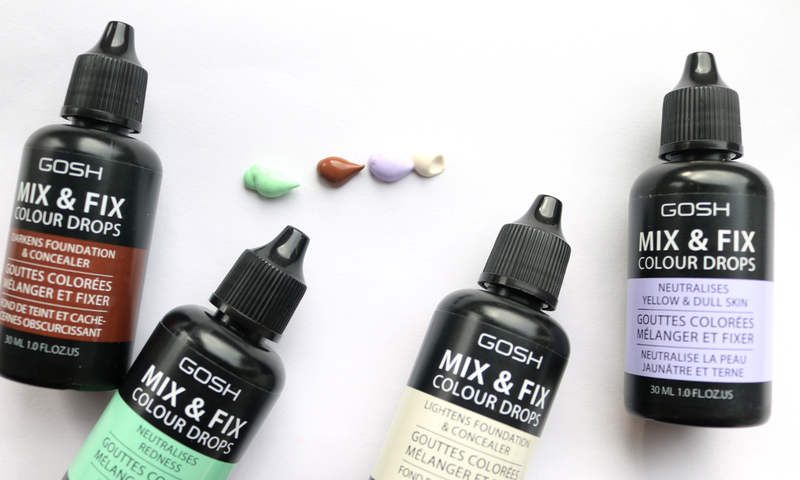 Being able to fully customise your foundation has been a big trend of late, so I was pleased to see one of my favourite cruelty-free brands GOSH, launch these clever Mix & Fix Colour Drops this month. Buying a new foundation can be a very difficult task. In the shops, you have to battle with insanely bright unnatural lighting, dirty or half dried up testers (do these things ever get cleaned or cleared out?! ), and on Saturdays, hoards of teenage girls around every single makeup display that has products for less than a tenner. Buying online is no easy feat either with different screens displaying colours in different ways, as you try to 'guess' your shade via a photoshopped image. Nightmare! What's even worse is the ongoing problem with makeup brands not catering for all skin tones, especially if you're dark, very dark or very pale. Couple that with the fact that most UK retailers won't accept opened products for a refund unless they're faulty and you could end up spending a lot of cash on foundations that just aren't right. So what's a girl to do? Luckily, a favourite makeup artist trick is now widely available to the masses in the form of highly pigmented, colour-correcting drops that you can add to any liquid base makeup, primer or moisturiser to create the perfect match, or to help neutralise certain colours in the skin. A number of brands do them and GOSH are the latest to bring out a collection of affordable options. Green neutralises redness as it's the opposite colour on the spectrum, so by adding a drop or two of green pigment to your usual primer or moisturiser, you can help to get rid of mild overall redness in the skin. Alternatively, apply a drop directly to any small red areas such as acne scars, to neutralise before applying your concealer - works a treat! Purchased a liquid foundation or concealer that's too light for your skin tone? Mix in a few drops of Dark to create the perfect shade. I find this one really useful for when I fake tan as it helps me to match my neck to my face so that I don't look strange! Purple helps to neutralise and correct any yellow tones in dull skin, and can work to balance out minor hyper-pigmentation as well. Just add a few drops to your primer and apply underneath your foundation for a brightening boost. Self-explanatory, but if you've bought a liquid foundation or concealer that's too dark, add a couple of drops of Light until you reach the right shade. Again, this is useful if your skin naturally becomes paler during the Winter months, as you can use it with your regular foundation instead of having to buy a new shade. I was concerned that by adding another product to my foundation, it would change the overall texture or consistency, but surprisingly, these don't seem to have that effect unless I add too much of them. There's obviously some trial and error involved in mixing up the right shades, but it's quite fun in a strange way! The Dark and Green Drops are the ones that I would personally get the most use out of it, but I can definitely see how they're all useful in their individual ways. I find these drops SO much easier to blend and work with than those cream-based colour correcting palettes as well. 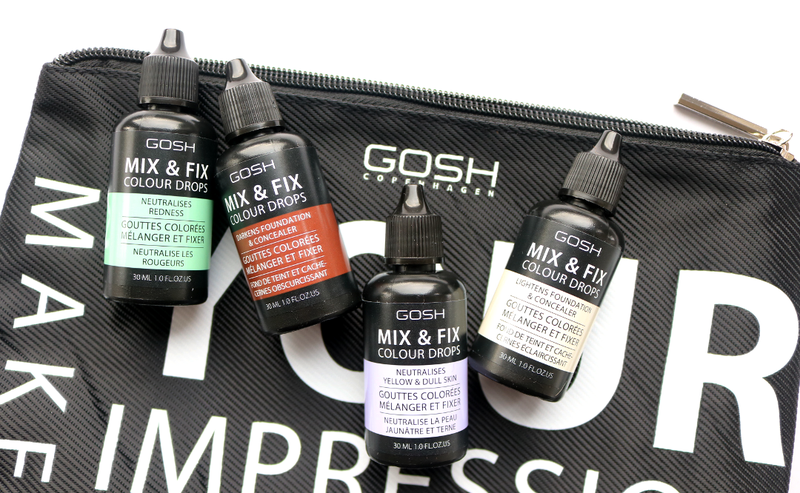 There's also another Mix & Fix Colour Drops in this collection called 005 Masala which helps to neutralise ashiness in darker skin tones, so everyone's covered! Do you use any colour correcting products? I had no idea Gosh is cruelty-free! Recently I've been thinking of making a switch to CF makeup once more (I have relapsed a few years back, shame, shame), and this new-found knowledge is certainly going to make it easier. Love Gosh! Thank you for the review, I really need to try the green shade for redness.